Joel Tudor's UC MODEL shaped by Hank Byzak. All clear sanded gloss finish with Volan forward thrust fin and knee patches. Triple redwood stringers of double 1/4" set 6" from a 1/8" center core. Black logo. Single center fin box, fin included. Retro, tough, stripped down no frills version. 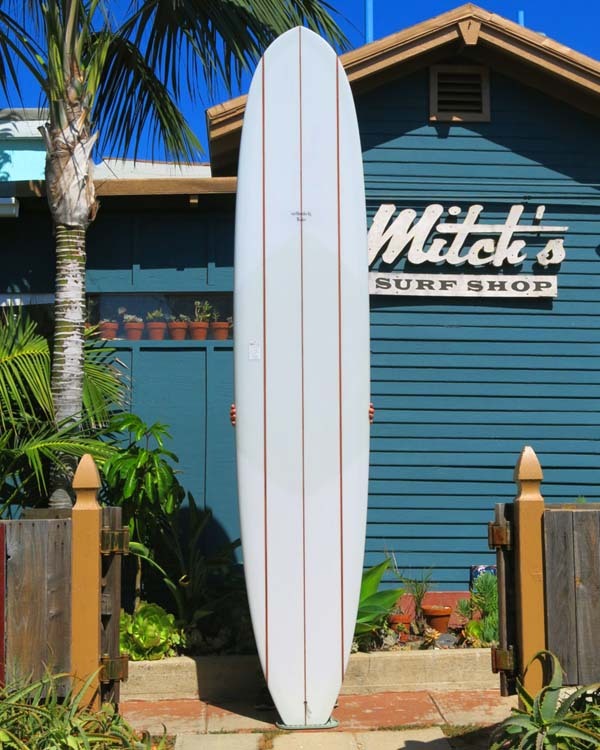 Length: 9' 8" Width: 22 3/4" Thick: 3 1/4"
Nose: 17 3/4" Tail: 15 3/8"
Joel's new UC MODEL, named after University City, his hometown neighborhood. Versatile with a pulled-in nose, squaretail; a friendly ride. Hand shaped and glassed of polyurethane foam by Hank Byzak.